export Golaem simulation CrowdField nodes as Simulation Cache files. which can then be edited using the Simulation Layout Tool and / or rendered. 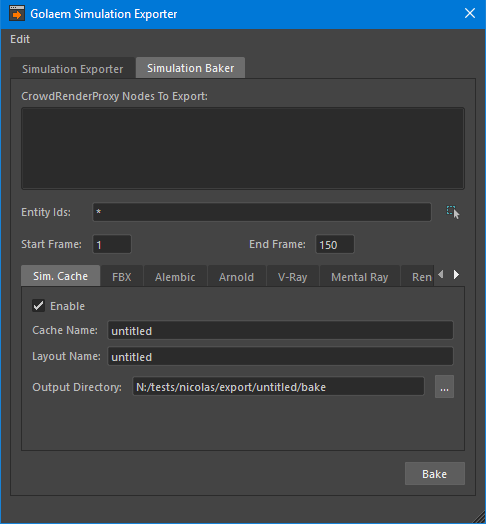 bake Simulation Cache files linked in a Crowd Render Proxy node as Renderer specific scene files (.vrscene, .rib, .mi...) or baked geometry FBX / Alembic files. Simulation Cache Parameters See here for more information. 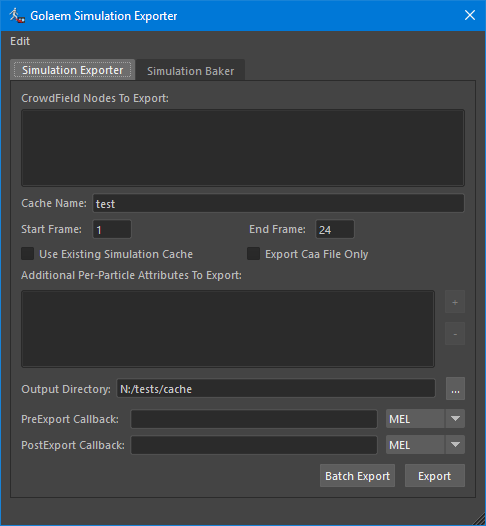 Batch Export Exports a MEL file in the directory specified in the Simulation Cache Output Directory. The generated MEL file can be used in a Maya batch process to batch export the simulation. See here for more information. Export Once the Simulation parameters are set, this button runs the simulation and exports it. At any time during the export, the process can be stopped by pressing the Esc key. Crowd Render Proxy Nodes List of all the available Crowd Render Proxy nodes. Only the Crowd Render Proxies selected in this list will be baked. Entity Ids Ids of the Entities which will be baked. Use to fetch the Ids of the entity selected in the Simulation Cache Proxy nodes. Sim. Cache See here for more information. FBX See here for more information. Alembic See here for more information. Arnold See here for more information. V-Ray See here for more information. Mental Ray See here for more information. RenderMan See here for more information.